Star chart is a free astronomy Windows 8 app available under the ‘Education’ category of Windows 8 Store. This Windows 8 astronomy app brings you a virtual 3D universe window where you can explore the universe and know about the wonders of our solar system. This astronomy app for Windows 8 calculates the current location of every planet and star visible, in real-time. It means you can know how far is Milky Way from the Earth and all other stars. You can know where the stars or the planets exactly are, know the name for Bright star, know where your star sign is in the sky, and know other wondering things. In addition, you can also switch to-night mode from day mode and vice-versa, right on your Windows 8 desktop. There are options to ‘Forward’ or ‘Backward’ which let you take a complete round of the entire universe. The app has all the 88 Constellations with amazing artwork. As you open the astronomy app, you will see a beautiful full screen 3D interface of the universe. Hold the mouse point and drag it to different places to explore the universe. Now, to check out the distance of a particular star or Planet, just click on that star, this will quickly open a long vertical panel at the left side of the screen where you will find all the facts such as distance, brightness, altitude, etc. You can also use the zoom function to view the sky deeply. To change from Night Mode to Day Mode or vice-versa, just right-click on the screen ? click on ‘Night Mode’ / ‘Day Mode’ given inside the horizontal panel opened. Let me tall you about the features of this Windows 8 astronomy app. Lets you view a virtual 3D universe in real-time. It has all the 88 Constellations with amazing artwork. Lets you switch between Night Mode and Day Mode. Lets you know the exact distance of a particular star / planet from the Earth. Similar apps: Science App, Funny Facts App, Knowledge App. Use ‘Win+Q’ combination to open search bar. Type ‘Star Chart’ in the search bar and press Enter key. Open it and click on ‘Install’ button to install the app. Check out your system’s start menu screen, you can see it there. 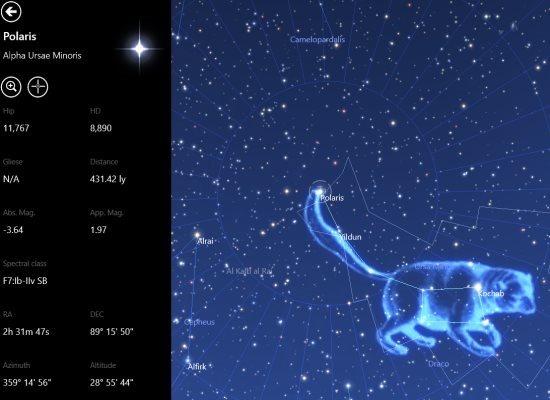 In short, Star Chart is an interesting astronomy Windows 8 app to explore the universe and to know more about the wondering facts of our solar system.